A great big shout-out to the guys at Runner+ who have worked their butts off making the challenges available to us! Yeah! I have spent a lot of words writing about how much I love and hate Nike+. I love the gadget, but I HATE Nike’s website. Now, I don’t have to worry about Nike’s slow and lumbering website anymore. I can track my runs on Runner+. Runner+ automatically downloads my runs from Nike’s website, so all I have to do is sync my iPod after my run and check out my graphs on their beautiful site. Runner+ gets their data from the Nike+ website, so your iPod is gathering all that data, but Nike isn’t allowing you to see it. With Runner+, you get to choose how detailed you want your graph to be. The cool thing about Runner+ is that you don’t have to own a Nike+iPod to make it work. It will work with the Garmin Forerunner 305 and 205 (and maybe even the new Garmin Forerunner 50). You can also enter your data by hand, so if you run on the treadmill and want to keep track of your data, you can. 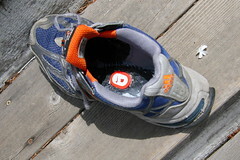 Best of all, you don’t need a fancy Nike+ to compete with other people. With the Runner+ Challenges, you can run against people all over the world. If you missed the joke, watch it again. Does Steven Tyler Have An Eating Disorder? 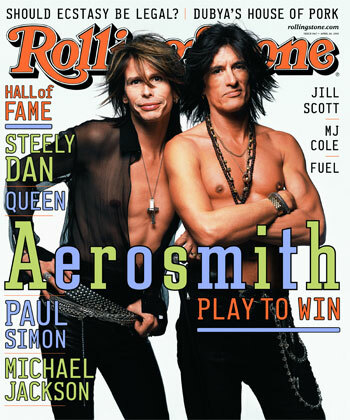 Steven Tyler is the lead singer of Aerosmith. He’s known for his thin frame and big lips. This weblog assumes that Steven Tyler has an eating disorder. He exercises. He eats fish and vegetables. He works hard to stay fit, but the gossip rags assume he has an eating disorder. Question of the Week: How do you NOT eat? There are times when we are with family, friends or coworkers. They want us to eat what they are eating. How do you NOT eat unhealthy food that isn’t in your food plan? I have continually caved in these situations. I would really like to know what you say or what you do to avoid ruining your food plan. If you think it’s hard to eat healthy when you’re dieting, just imagine how hard it would be to eat healthy on $3 a day. What can you eat for a buck a meal? The food stamp program in the U.S. was meant as a supplement, but there are those who survive on their food stamps. How do they do it? If you would like to try to take the Food Stamp Diet Challenge yourself (as was done by many politicians) to see what it would be like to live on $3 a day, there is a detailed PDF that you can download from this site. Is this a good weight loss technique? No, but it’s an inspiring way to teach compassion for those who are in a bad situation. No one would willingly choose to live like this. Fat girls never talk about inner thigh chaffing. Even when we get thin, we don’t talk about it. That’s how you can tell the naturally thin athletes from the used-to-be-fat ones. The naturally thin athletes have no problem talking about Vaseline, lubricant and clothing that prevents chaffing because they have no shame attached to it. Instead, I find clothing that works and never talk about how grateful I am that my inner thighs are chafe-free. I never talk about how my gym clothes don’t ride up. 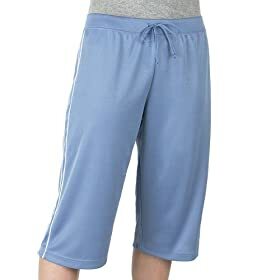 Case in point, the Women’s Pro Spirit Core Mesh Capri Pants. I found these at Target. I bought them on sale for ten bucks. I tried out one pair and was back to the store after one workout and cleaned out the store. Then I went to the Target on the south side of town and bought all of them in my size there too. I’ve been exercising with them for months. I love them because my inner thighs don’t chafe and they don’t ride up. Why is it so hard for me to say that? Garmin has just introduced the Forerunner 50. A fitness watch without the GPS unit, but it includes a heart rate monitor and foot pod (to track distance and speed like the Nike+ does). Best of all, when it’s available next month, the cost will be $213 (with additional $60 for the cadence sensor for cycling). That’s WAY cheaper than the next best thing from Garmin, so they are making huge leaps in affordability. I can’t find any other evidence of Garmin Connect online, so I’m wondering where the website is, how the software works and whether it is any good. The only reason I have any interest in this is because of Runner+. It’s a website kind of like Nike+ in which you can keep your runs online. It communicates with my Nike+ and automatically uploads my runs into its website. The data is actually better than what Nike+’s website shows me. The founder of the website says that he is adding challenges just like Nike+ has. Update 11-08-07: They added the challenges and they’re AWESOME! Come play with us! The good thing about Runner+ is that it’s not limited to Nike products. It will soon work with Garmin Forerunners 205 and 305. If the Forerunner 50 uses the same system, then it might easily be used on the Runner+ site. 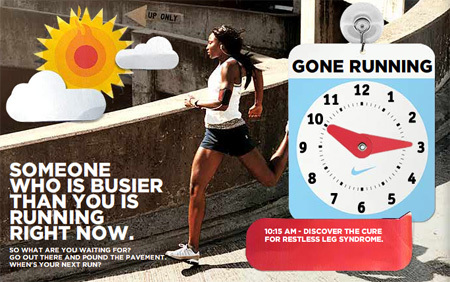 I could run with the Forerunner and leave the Nike+ (and its buggy website) in the dust. I saw this ad at the mall the other day and didn’t realize it was an advertisement for Nike. I have a love-hate relationship with Nike. I hate that they only carry uber-small clothing sizes. I hate their website. I love their watches. I love their advertising. I love Nike+. My new mantra is: someone who is busier than you is running right now. No excuses for skipping my workouts.